Over the decades I’ve run serious and extended campaigns in a half-dozen superhero systems. This weekend I pulled together all of the core books I had for different superhero games. I ended up with twenty-eight: from Aberrant to Wild Talents. And that’s just hard copies- I have many more in electronic format. And that’s just core books not the secondary material: citybooks, villain books, modules, alternate settings, WW2 books, power guides, and so on. Honestly if you told me I couldn’t run Fantasy games anymore, I’d turn to superheroes. I’ve done some of my favorite work in that genre- exploring themes and ideas more concretely than in many other games. Yet superhero games still feel like more work to me. I’m a fairly improvisational GM, sketching perhaps a few pages of notes for a session and spinning off previous work for many sessions. When I run a supers game, on the other hand, I dig in. I feel obligated to generate the news, to come up with colorful secondary characters ahead of time, and to develop fully-fleshed mysteries. I don’t want a supers game to be just about the fights- I want something more. But I want spectacle. At heart I’m still a kid getting up early Saturday morning to watch the Superfriends despite having seen the episode many times. Today kicks off another History of RPG’s series. In the past I’ve covered Samurai RPGs, Horror RPGs, and Steampunk & Victoriana RPGs. I’ll be aiming for a weekly release, but we’ll see how that goes. Each list will cover a small slice of time, beginning at the dawn of supers gaming. In past lists, I’ve focused solely on core books and covered each game with a single edition. This time for most of the game lines I’m mentioning each of the major revisions and editions. Hopefully I’ll provide some sense of what shifted between them. I’ve also decided to cover some distinct supplements- third party material and campaign books which offer a striking set of new options or ideas. Generally I’m only including published material- print or otherwise. I’ve left off freebie or self-published games unless I think they’re really important. I’ll try to provide some context for the superhero material happening in popular culture at the same time. For this first list I had a hard time finding official stats for which comics had dominance. It does include Byrne and Clarmont’s run on X-Men and Miller on Daredevil. This period does include the release of Superman I &II, Swamp Thing, and Condorman. On TV we had Spiderman and His Amazing Friends, the Dr. Strange movie, and The Incredible Hulk. I'm sure I've left something off without adequate reason; feel free to add a comment about a line I missed (if published from 1978-1982). I've arranged these in by year and then alphabetically within that year. If you have a chance you should take a look at this game. I know I "played" it, but looking back I'm not sure I can actually see what the system is. Not that I can't figure it out, but I don't think there's actually a game system here. For one thing, though you make up and play superheroes you have no rules for superpowers. You define an archetype and assign points to stats, but that's about it. It has some charts and odd resolution mechanics (like a Stamina Modifiers table). But at the time it generated a world of ideas for me. I don't think at the time I got the actual setting of the game- a future sci-world with supers (hence the title year). Probably the coolest thing in the game was a whole set of rules for playing a solo game. It included a time planning worksheet, rules for patrolling, random crimes table, and details for dealing with litigation. More than anything though, it showed that you could do supers in an rpg and pushed forward other games. Point-Based (sort of). No super powers system. Various dice. Sitting in the back room of the first incarnation of the Griffon Bookstore my friend and I "played" S2044. At the same time I could hear my sister's group playing a new game- one with an actual resolution system, defined powers, and the real feel of comic books. I remember having my first pangs of edition wars, wanting the game I played to be better, to win. But soon enough I begged my parents for a copy of V&V and rolled up my first character. Five powers: Heightened Constitution, Claws, Darkness Control, Regeneration, and Revivification. The bringing people back from the dead seemed like a loser power to 10 year-old me, but that's what I rolled. As opposed to S2044, V&V went generic, with almost no discussion of a specific world or setting. 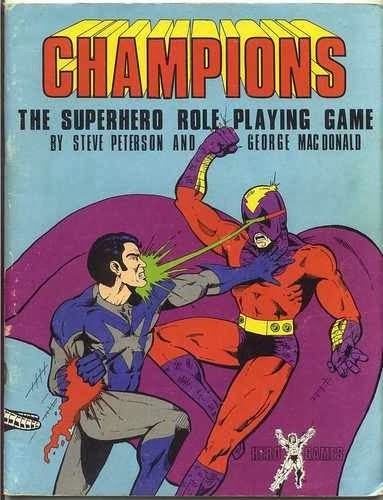 It assumed you knew what a comic book game would look like. The visuals from Jeff Dee and Pete Matthews echoes the look of hotter properties of the time: Grell's Legion of Superheroes, Cockrum's X-Men, and even Simonson's Manhunter. V&V 1e echoed conventional games- with stats and levels complimented by random power tables. The combat system relied on a full-page matrix table, comparing attack power to defense power. Beyond that I can't remember how the system worked. V&V 2e completely blotted out my memory of this version since it cleaned things up so well. Random Powers. Level-Based. Various Dice. A game I never heard of until I began this research. It seems to have been an adaptation/rip-off of Superhero 2044with more details and numbers. RPG Talk has an interesting overview on it. More fascinating is the comment from a playtester on RPG Net. He talks about the couple who wrote the game and the investment they had in their 'rules vision'. They apparently put out a couple of supplements for the game as well. Different Worlds #23 has an article from the designers. As a sidebar, Christian Lindke has a great article looking at DW #23. 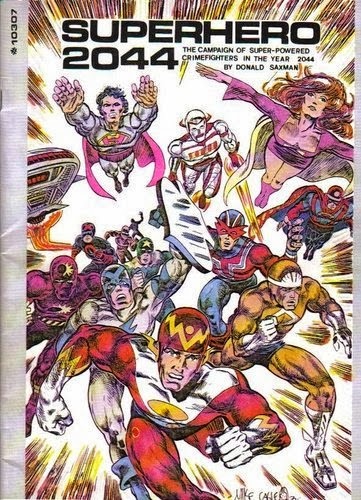 That issue has a strong focus on superhero games of the time, including a survey of the genre at that moment in 1982. You should check out his write-up here. Point-based. Various dice. 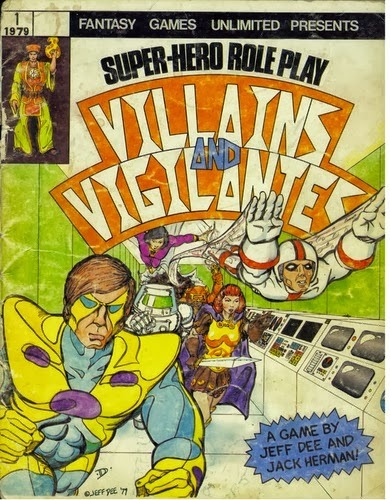 Villains & Vigilantes dominated superhero roleplaying in our neck of the woods. Then came Champions. It quickly spread among the gaming groups, even those who hadn't been playing superhero games. A new generation of players latched on to it. In my post on Champions in general, I mention the split it created: between those who wanted a looser, more story-driven game and those who wanted detailed four-color combat. But more than that Champions empowered players in a way few other games had. 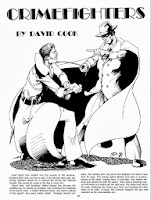 It can be argued that superheroes came out a tradition of pulp heroes. 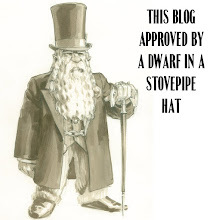 Many of these existed as gentlemen adventurers, with roots in Victorian literature. Eventually masked or costumed heroes would emerge, with the Shadow as the best known. This complete game came in an early issue of the Dragon. I remember reading it one summer, along with a stack of Doc Savage novels I'd taken with me on vacation at my grandparents in Kansas. I loved the concept of the game and made up many characters, but never actually played it. Crimefighters is impressive for an add-in to a magazine. 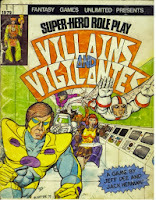 At 22 pages it has all the rules necessary for a masked crimefighter game, including an adventure and a page of notes on the genre. Excellent art by Dee and Willingham make it a complete package. The game system itself is fairly basic. Players roll percentiles for their six stats (seven actually since Accuracy's measure for left and right hands). Then they can spend points based on those stats for Mental and Agility skills. These skills are a mix of traditional skills and special abilities- like climbing, aerial flips, and archaeological. Players have a 5% chance to have a mysterious power as well, of which there are ten. The whole thing feels very old school. It does have a few interesting bits- with certain character types gaining more of less experience based on their actions (Pragmatist, Defender, Avenger). Players also roll for contacts who can offer special kinds of info during a case. Random powers. Level-based. Various dice. Growing up I developed a wariness about some FGU games. I'd been told they had complicated mechanics, dense rules, and detailed bits. I lumped together Space Opera, Aftermath!, Skull & Crossbones, and Chivalry & Sorcery in that category. But I loved reading Doc Savage novels and so when I had some extra bucks I picked up Daredevils and tried to read it. Much as I would later do with Bushido, I tried to grok this system but never really got it. It had some seriously crunchy bits, but more the order of presentation and layout worked against the game. Is it a superhero game? Yes, in the broader definition of that I mentioned above. Like many pulp genre rpgs it goes all over the map- from Raiders to Marlowe to Movie Reel Horror to The Shadow. To that end it offers five pages of optional rules to cover mysterious masked heroes with unusual powers. Daredevils has players roll to see how many points they get to spend on powers. Each power has a distinct cost, but the GM may also allow players to acquire them randomly later in play. The game only provides a dozen powers, plus to different forms of enhancement to each of the seven "talent" areas. Random and point-based. d6, d10, d20 dice. A game I remember seeing on the game store shelf, but never picked up. 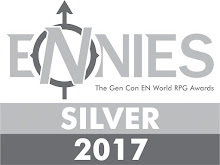 It straddled the line between board game and rpg so I wasn't sure what it actually was. That's a little strange given that I loved TFG Games like Intruder andSpellbinder. It offers rules for making characters, but primarily exists as a game for running fights between superbeings from preset scenarios using counters and a map. Beyond that, I'm unsure how this game operated. 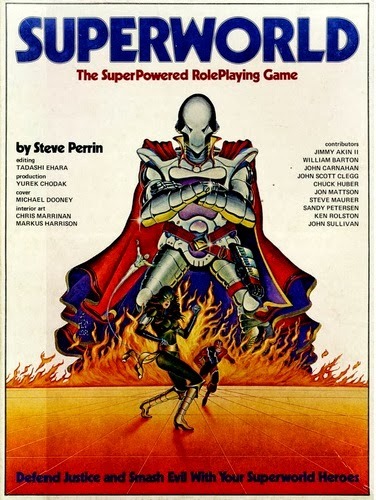 I remember the big push by Chaosium in the early 1980s, getting a number of different games out on the market, all built on the Basic Roleplaying engine. I loved Stormbringer and some of the other systems, but I skipped on Worlds of Wonder when it hit shelves in 1982. That contained Future World, Magic World, and Superworld. I'm not sure what made me take a pass on it- perhaps thinking that Champions already offered the best game. I was already a stupid game snob by that point. At least in part I was suspicious of a superhero game being dropped in on top of another game engine. Strangely later that same year Chaosium released an expanded and independent version of Superworld (but not the others). This boxed set includes a 32-page character creation book, 40-page powers book, and 40-page GM book. It uses the BRP system with powers added on. Players roll their seven characteristics individually; they then can spend that total on powers. Superworld pays homage to Champions in several places here. Effects define powers (Snare, Supermove), limitations and advantages modify costs, and powers require energy to use. There's some interesting material here- particularly in the campaign section. The game got an expansion with the Superworld Companion in 1984. It also appears in some of the multi-system modules of the era: Bad Medicine for Dr. Drugs and Trouble For HAVOC. I have a copy of this in my hands now, a rare treat, but when the second edition (called "Revised") came out I scoffed. 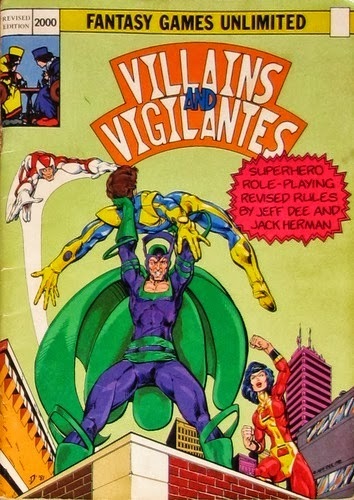 V&V was dead, man-- Champions had put it in its grave. Why bring back a dead game- where you rolled your powers? It felt like a cheap money grab. I put off buying the boxed set but eventually I came into a copy that sat on my shelf. Until I met Gene Ha- who loved V&V 2e dearly. For several classes in high school we sat at the back with Gene running a V&V campaign on the fly- one with weird extra-dimensional corporations and highly detailed graphics. I ended up lifting many of his concepts for later campaigns. But more importantly I came to appreciate V&V. The revised edition cleaned up many problems and its actually a model of economy system-wise. FGU would put out many modules over the following years, but they never released a "companion" or "expansion." This game stood well enough on its own. It also showcases some of Jeff Dee's best work- stuff which sticks with me. Its only 48 pages long and very old school. Roll stats, roll powers, figure hit points and like details. Combat still uses an attack vs. defense matrix, but much reduced. Players roll a d20 under a modified target # to hit. The actual mechanics only take up about 2/3rds of the book. it does use one of my least favorite mechanics: players can have different #s of actions without any kind of balancing mechanic. Still it remains a solid example of old-school gaming. It ended up vying for dominance in our groups for years. If you didn't want the math of Champions and hoped for a pick-up game, you went with V&V. Random powers. Level-based. Various dice. At this point I thought I had played or run every superhero game known to humanity but Crimefighters...I am just not sure. I remember that cover and yet I don't recall playing it. Wow. Thank you for that one. 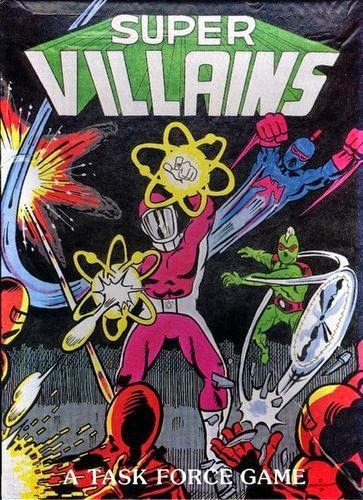 Villains & Vigilantes was our mainstay game for some time when we weren't playing Star Trek or my rather superhero-like D&D game. As time went on a rivalry developed between those of us who played V&V and those who played Champions of Marvel vs. DC proportions. For a math-o-phobe like myself, Champions looked absolutely terrifying. I wouldn't even give it a try until my second year of high school. I played it for nearly two years (roughly) before I ever saw my character sheet and it was a bit after that when I started learning the rules. Now it's probably my favorite Supers game (although I really love M&M 3rd Edition). Can't wait for the rest of this series! Awesome! So looking forward to this. Where I grew up V&V ruled the roost till Marvel Superheroes came along. 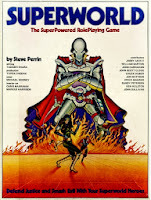 I remember Super Game, once named the worst RPG ever designed. The publisher (who was also involved in the filk industry) used to bring copies of SG to every convention he ever attended, in the hopes of selling every copy he had and so clearing out a warehouse. Don't know what happened to him. V&V is still alive and well. As is Champions. I also owned Superworld back in the day, and still have the stuff tucked away. Yup- I plan to get through the various editions up to the most recent versions chronologically. For a reason I can't remember, back in high school I wrote up a bunch of powers for Champions and mailed it in: poison, immovability, multiplication (making copies of yourself), and a few others. Unfortunately, I wrote the whole thing out by hand and mailed it in so I don't have a copy. They put my name in the credits of Champions II, though. Yes, a lot of fun stuff in V&V, especially that early Dee (and Willingham) art!